On Monday 16th June, NIDL professors Mark Brown and Grainne Conole contributed to a very successful event at Athlone Institute of Technology on the theme of the ‘Flipped Classroom’. The event attracted around 80 participants and was part of the National Seminar Series being managed by the National Forum for the Enhancement of Teaching and Learning. 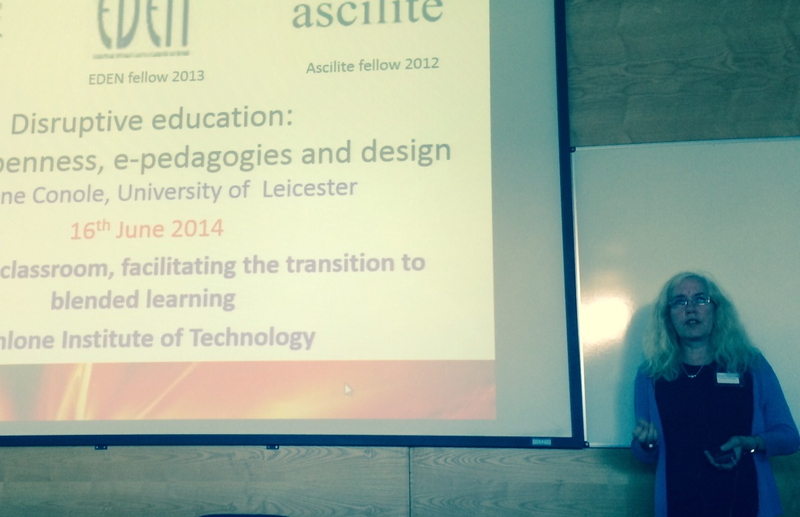 Grainne’s opening presentation looked at the bigger picture of flipping, openness, e-pedagogies and design. She explored the disruptive nature of new digital technology and some of the implications for teaching and learning. Mark then followed up by looking at the concept of flipped learning within an institutional context using a novel ice-cream metaphor. He argued that the right type of institutional culture was essential for fostering and sustaining innovations in teaching and learning. Finally, Dr Bryan McCabe shared valuable lessons and insights from his experience of ‘flipping’ at NUIG which showed that enhancing learner interactivity and engagement was something that any teacher could do through incremental changes. The three presentations worked well together and thanks to the Athlone team for organising such a successful event. Already Grainne, Mark and Bryan have discussed offering another version of this flipped classroom event at other locations and institutions.